Nothing beats experience, especially when it comes to engineering a performance-driven race machine like the 22™ SCT. To create it, TLR engineers used all the knowledge and experience they gained from making the revolutionary 1/10-scale 22 buggy. They built on the championship-winning 22 platform and took it to the next level. 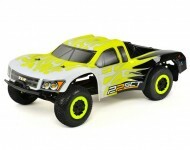 And now the 22 SCT is the most innovative, durable and competitive short course truck ever designed.